Previously we gave you a chance to gain some entries in our 2012 Panini America NFL Player of the Day promotion simply by following the main promotion on Twitter at @PaniniPOD Besides gaining entries in our contest, one of the benefits you got was instant updates on contests being run directly by Panini. Today they announced the winner of their first twitter contest. 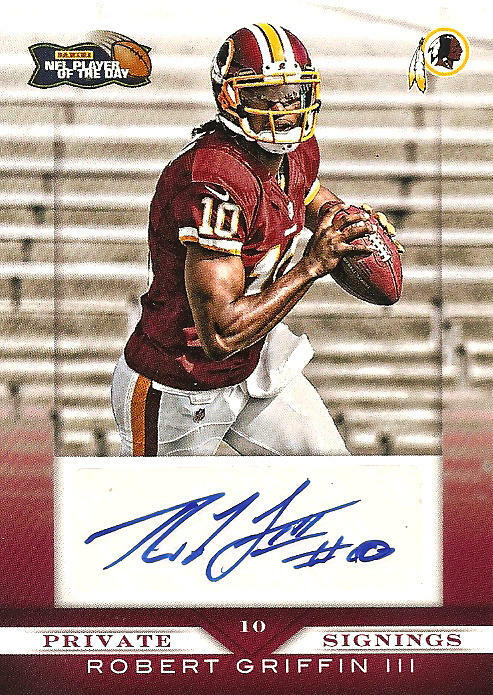 The prize was this auto card of RG3, Robert Griffin III. If you have a Twitter account and want a chance at one of 3 T-Shirts that Panini is currently giving away and future opportunities to get in on their contests, make sure you are following @PaniniPOD then use this link, retweet and you are in. It is that simple. Good luck!